It's been a while since I have been out on the kayak counting and photographing shorebirds so it felt extra good to go out very early one morning a couple of weeks ago. There were banks of low cloud and fog to the east. The sea was very still and the sun shone off the top of every little ripple and threw bars of light up onto the mangrove trees standing in the water. I wish there were a way to capture this with photos but I find it sufficiently challenging to take photos from a kayak - let alone staying steady enough to manage videos! 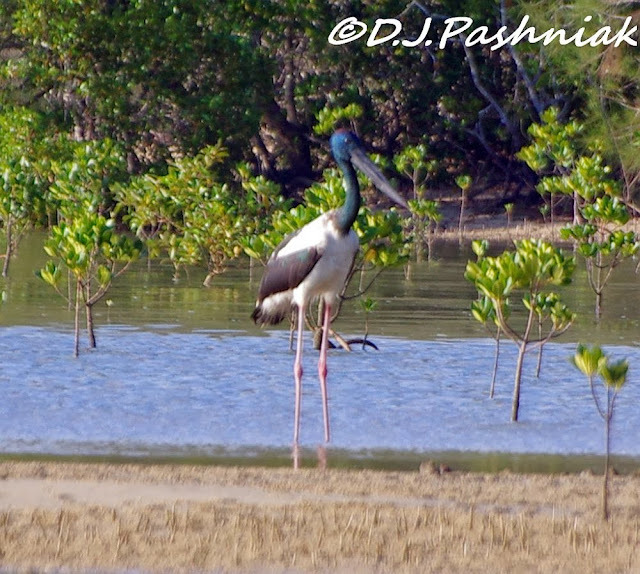 I turned south around the mangroves which line Mullens creek and saw there were numbers of birds standing on the sand. I saw three Common Greenshank, and three Terek Sandpipers but the rest were Grey-tailed Tattlers. Some of these were still showing the remnants of breeding plumage down the front. I took a number of photos of these birds - hoping that I could maybe do a better count and ID later. The most obvious birds were the Eastern Curlews - unmistakeable with the very long bill! As I focused on different areas of the birds I realized that there was something else moving around behind the mangroves. It was a Black-necked Stork. (Look very carefully along that long line of birds!) These birds are tall - 112-115cm or well over 4 feet tall. I have not yet been able to get close enough for good photos - and this was the best that I managed this time! Such wonderful and beautiful birds, Mick!! And, as always, your captures are superb!! Thank you for sharing!! Have a great week! Great series love the Black-necked Stork. Beautiful photos. I really love the first one of the mist and fog over the bay before dawn. Beautiful scenes and wonderful birds, Mick! The Stork and the Curlews are my favorite. I love the stork in flight shot. Great photos, have a happy week! 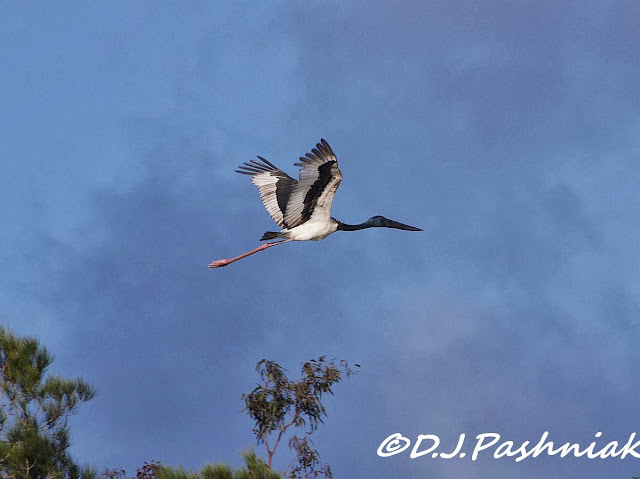 the stork is an awesome sighting! i love the first two photos. the gray layers in the first are just beautiful! I love the stork! Must have been a great outing. Wow - what gorgeous shots. That last bird shot is spectacular and I love the ethereal feeling of the first one. Wow! I love the Stork... a wonderful post with fantastic images. That first photo was very atmospheric - excellent. Also thought the shot of the stork flying away was spectacular. I really am going to come up to your neck of the woods sometime (after baby is born! ), you are a very good travel agent!! Just looks amazing. Wonderful photos! How fabulous to see the flying stork. They're bigger than I realized. Beautiful shots. The first photo is awesome. The Kayak is a great way to sneak up on the birds. That first shot is magical! Gosh that stork is huge, I can see him towering above the other birds! Excellent in-flight capture! very cool - I love the first and the last photo! I'd love the kayak ride and lovely scene you captured while out there in the fog --- fabulous birdlife and photos of them! That stork is a great bird - do you see them very often? That first shot is terrific - like a painting, See what you mean about those Eastern Curlews, with bills like that even from a distance is a very obvious field mark. Beautiful are the birds photos! what a thrill to se the stork coming towars you. And you got great shots of it. What great shots you get from your kayak! Hi Mick.. Great photo's would not have know you was in a kayak, unless I read it!! That Stork is a reallll tall fella, both shots are fabulous!! Ha!! As I was scrolling down exploring the post I thought "That looks like a jabiru. I wonder if Mick noticed!!!" Great post. I also am intrigued about photography from your kayak and will keep an eye out for any photos you might post of equipment & how you set yourself up (hint!!)! I don't have a kayak (yet) but spend a lot of time near a similar sort of spit at the top NE end of Phillip Island in victoria. I would be very nervous with my camera & long lens on the water! I am feeling jealous that you are out photographing shorebirds. I think nearly ALL of the ones that pass through Ontario on their way south from the Arctic have already done so. Now I must wait till spring. Your photos of the Black-necked Stork are wonderful. I love coming to your blog! I know it's been a while... I haven't been out birding for a while due to haing knee surgery & then developing a DVT in my leg. I've been grounded for a while, so nothing much to post except our holiday to Port Macquarie (gift from my parents). I always love your shorebird shots and reading how things are going in the GS Straits. 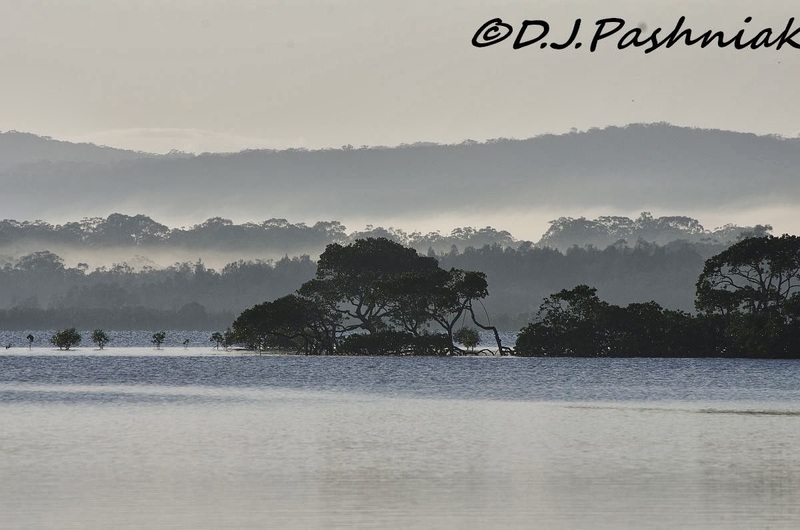 Have you made it down our way to the Pumicestone Passage recently? I'd love to know how accessible the shorebirds are with my 250mm reach. Unfortunately we won't be able to come up your way again in the next 6 months or so as I am due to have shoulder surgery in November but I'd love to try out the Pumicestone Passage before then.